Wilmington, NC, may be small, but we definitely know how to have fun, and we tend to do it in a unique way. Matter-of-fact, there are two new unique entertainment options making root in the Port City as this is being written. Soon, visitors to Wilmington will be able to enjoy a game of inflated fun with Wilmington Bubble Soccer and a pub tour on the pedal-powered Trolley Pub. 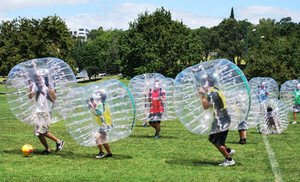 Wilmington Bubble Soccer is similar to regular soccer, but players participate wearing large inflatable orbs. Their hands are secured within the orb, so they have to focus on maintaining their balance with just their feet. Instead of a kick-off, players make a mad dash to claim the ball at the start of the game. The owners are currently doing demos and collecting sign-ups for leagues, parties, fundraisers, etc. Learn more at WilmingtonBubbleSoccer.com. Trolley Pub is a 2-hour tour of bars and eateries in the downtown area of Wilmington. 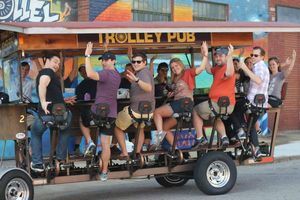 14 patrons can ride the open trolley, which is powered by their own pedaling, and receive a unique look at local alcoholic offerings. Other Trolley Pubs are a Bring Your Own Beer experience, but that portion is under review by the City of Wilmington. Either way, this is a unique way to enjoy Downtown Wilmington. Learn more at TrolleyPub.com. Also, make sure to check out Cape Fear Escape Room. Located on Oleander Drive, this is also a unique source of entertainment. Participants can get their friends, family, or coworkers together and attempt to “escape” from the room they’re locked in. They have 60 minutes to find clues, solve puzzles, and work their way through mind-boggling twists to get out and win the game. Learn more at Cape Fear Escape Room. If you prefer something with a little more action, Wilmington is also home to a DefyGravity Trampoline Park featuring 23,000 square-feet of trampolines, a ninja course, foam pit, dodgeball cages, and more. DefyGravity hosts age-restricted hours, family night, open jump, dodgeball, and fitness classes. There’s also a discount for larger groups. Learn more at DefyGravity.us. Wilmington has a many creative thinkers who are willing to search outside the box to provide fresh entertainment options for residents. Have you had an experience with any of these businesses? Share in the comments below! 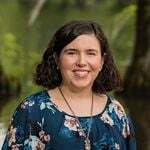 Also share other unique entertainment options that you’ve found in the Wilmington area.